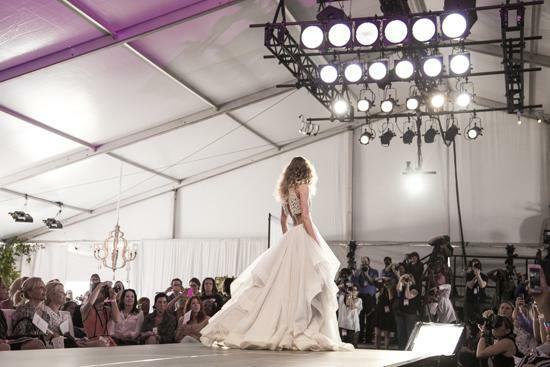 One of the most exciting nights at Charleston Fashion Week was the Spring Bridal Show! The room smelled like a bouquet of flowers, hors d’oeuvres sizzled on the grill, and the sight of cupcake towers made you quickly reconsider the diet you were on! Floating down the runway like small clouds, featured and emerging designers showed some of their season’s best in bridal gowns. A-line and mermaid silhouettes seemed to be most prevalent that night, with the exception of a few over-sized princess dresses. The total outlook of the gowns were more soft and delicate, which appealed to the hot-weathered southern audience. The trend forward looks of the night were the tw0-pieced dresses. This was definitely a look for the young (in shape) girl who is non-traditional and doesn’t mind baring a little skin! You can find these styles featured in Whitney Deal, White Boutique, and Lula Kate’s collections.